Only Kosher food is served at the Kaplan Cooperative Preschool. This includes snack, birthday celebrations, and school sponsored events. While we do no request that you send in a kosher lunch, we do not allow meat or poultry in the building. Please do not send any meat items in your child's lunch, even if you keep a kosher home. If you would like your child to have a meat lunch, we offer kosher catering 4 days a week. Contact the office for more information about the catered lunch program. We are a peanut-free school, other tree nuts are allowed in lunches. We do not allow any home baked goods in the school—including birthday cakes and cupcakes. If your home is strictly kosher, please obtain permission from Rabbi Scheinberg to bring home-baked goods into the classroom. Our school celebrates all of the Jewish Holidays. We learn about Thanksgiving, and of course we honor parents on Mother's Day and Father's Day. Christmas, Easter, Halloween and Valentine’s Day are not celebrated in our school. Please respect the school’s policy by not sending your child to school in a Halloween costume or sending Valentine’s Day cards to be distributed through our school mailboxes. Children are welcome to celebrate their birthdays in the classroom during snack time. Parents may provide a kosher celebration treat but no favors or other party items may be brought in. Family members may join the class for this celebration (please check with the office). The teacher should be notified of your intentions a few days prior to the event. If the entire class is being invited, you can distribute invitations or thank you notes for birthday parties in the class mailboxes or use the class e-groups. If you are not inviting the entire class please do not bring invitations or thank you notes to the school. We have several school parties planned during the year. Out of respect to the families we ask that you do not schedule birthday parties in conflict with school events. 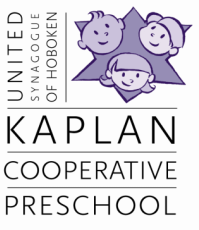 The Kaplan Cooperative Preschool follows the Hoboken School System closings on snow days or bad weather days. In addition, our Preschool will close for Jewish holidays as noted on our calendar. School will also be closed at the Director’s discretion should there be concern about weather or road conditions. You can check the class e- mail group or school website for information on school closings. There will be no refunds for days missed due to weather. Remember to always check the Preschool calendar; when in doubt call the Preschool office or e-mail us at ushpreschool@gmail.com. It is our philosophy that discipline is not punishment. At all times we strive to teach our students, to make positive social choices that help them become dynamic members of our community. We work on skills that support the development of positive self-esteem, good communication, skills and self-discipline. We always expect kindness and consideration for others and want to instill pride and good feelings in every child. Our rules are simple and easy to follow. Below are the usual steps we take to discipline a child but since every child is different we may choose to change our responses in order to suit your child’s needs, this will happen at the teacher’s discretion and in an age appropriate way. A teacher will point out the behavior that is disruptive and then suggest to the child “make another choice.” The teacher will also help the child to redirect him or herself. If the behavior continues, the teacher will explain to the child the effect that their behavior is having on the other community members. S/he will be helped to “make another choice” or redirected. This is when a child may be asked to sit out or removed from the situation. The child will sit briefly by him/herself and the teacher and child will discuss the behavior. This is time for the child to recognize why the choice they made was not a positive one. The teacher will ask the child if they are ready to re-join the group. At this point the choice is up to the child to join the group. The purpose of this is for the child to be able to recognize when they have re-gained their self-control and are ready to re-join the group. The other objective for a child to sit briefly alone is for him/her to observe children and adults interacting in positive ways or to “pull themselves together”. This policy is to aid your child’s social/emotional growth. All the teachers at Kaplan have training in Early Childhood Education and developmentally appropriate practices. Each child enrolled in our school must have had a health examination performed by a health care provider within one year prior to admission and recorded on the Universal Child Health Record or equivalent and updated annually. Children attending school need to be in good health both for their own benefit and the protection of classmates and teachers. Please keep your child home if he or she is ill or uncomfortable. A child who does not feel well cannot effectively participate in the school program. Parents should call the school if a child is ill and unable to attend that day. the past. It is important that your child remain at home if he/she has fever, diarrhea, a persistent cough, nasal discharge or other contagious condition. Otherwise it is difficult to keep everyone in the classroom healthy! After being absent due to illness, children must be fever free for 24 hours before returning to school. Children must be on antibiotics for 24 hours before returning to school. Children who come to school are expected to partake in all activities, including going out-of-doors. If you feel that your child is not up to being part of the entire program, please keep him/her home until he is totally recovered. Should your child become ill in school, he/she will be separated from the group. You will be contacted and expected to take your child home within one half-hour after the call has been made. If you are not available, emergency contacts will be called. It is important that the school is aware of local emergency contacts. During the school year, if your child develops any conditions or specific needs that may require special accommodations, please notify the Preschool Director. Please see the Policy on the Management of Communicable Diseases below for more information. Once the child is symptom free, or has a physician’s note stating that he/she no longer poses a serious health risk to themselves or others, he/she may return to school. If your child is exposed to any reportable disease at school, you will be notified in writing. When possible, a child’s parents and physician should try to minimize the need for medications while in childcare. Medicines ordered twice a day should normally be given before and after, rather than during, childcare hours. Medications ordered to be given three times daily also may be planned so that they are given in the morning before the child leaves for childcare, in the afternoon after the child returns home, and again during the evening. However, in some cases, administration of medications during childcare hours is unavoidable. Parents or legal guardians will provide the medication in the original container. Instructions for the dose, time, and how the medication is to be given, and the number of days the medication will be given will be provided to the school director/assistant in writing (by a signed note or a prescription label) by the healthcare provider. This requirement applies both to prescription and over-the-counter medications. A health care provider may state that a certain medication may be given for a recurring problem, emergency situation, or chronic condition or prevention. Example: sun screen, acetaminophen, Epi-pen. A child may only receive medication with the permission of the child’s parent or legal guardian. A list of your child’s allergies to medications or other substances or foods should be kept strictly up to date in school files. This information is posted in all classrooms. A. Each child may be released only to the child’s custodial parent(s) or person(s) authorized by the custodial parent(s), to take the child away from the school and to assume responsibility for the child in an emergency if the custodial parent(s) cannot be reached. A child shall not be visited by or released to non-custodial parent unless the custodial parent specifically authorizes the school to allow such visits or release in writing. This written authorization, including name and phone number, shall be maintained in the file. If a non-custodial parent has been denied access, or granted limited access, to a child by court order, the school shall secure documentation to that effect, maintain a copy on file, an comply with the terms of the court order. An hour or more after closing time, and provided that other arrangements for releasing the child to his/her parent(s) or person(s) authorized by the parent(s), have failed and the staff member(s) cannot continue to supervise the child at the school, the staff member shall call the Division’s 24 hour Child Abuse Hotline (1.800.792.8610) to seek assistance in caring for the child until the parent(s) or person(s) authorized by the child’s parent(s) is able to pick up the child. Parent(s) will be required to pay a fee of $20/hour for care of child. If the school is unable to make alternative arrangements, a staff member shall call the Division’s 24 hour Child Abuse Hotline (1.800.792.8610) to seek assistance in caring for the child. Immediate expulsion could be warranted by safety concerns or potentially dangerous behavior conducted by a student or parent. We will not expel a child based solely on the child’s parent making a complaint to the Bureau of Licensing regarding a center’s alleged violations of the licensing regulations or questioning a center directly regarding policies and procedures.